Elysia Feldon lives an idyllic teenage existence. Her biggest concern is whether her best friend, Rhys, is in love with her childhood nemesis. That is until an invading tyrant takes everything she holds dear. Her father and Rhys go off to war, her village is attacked by raiders, and her home is burned to the ground. Alone and afraid, she struggles to survive until she meets other refugees. Together, they create a hidden sanctuary in the mountains and make a stand against the invaders. Tales of their escapades spreads, and the legend of the Shadow is born. 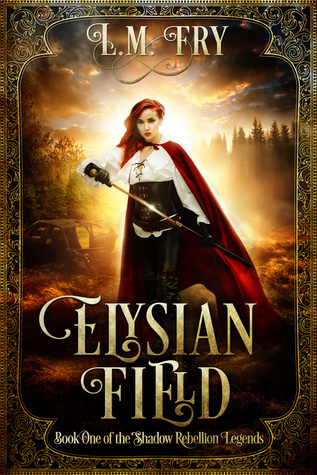 Elysian Field is a dystopian YA fantasy that takes place just outside of Washington D.C. The book follows a 16-year-old girl as she goes from a carefree innocent girl to a hardened woman who is determined to avenge her village after raiders decimated it. I thought Elysia was kinda a brat at the beginning of the book. All she cared about was hanging out with her best friend, Rhys, avoiding her childhood bully, Nicolette, and trying to learn the healing ways from her mother. She found love with Rhys but that was very short-lived. Everything changed when all the men between the ages of 16 to 60 are drafted to fight in a war against raiders from the north. Then Elysia was the person who took care of her mother and 2 younger brothers. When the Mayor of her village came home and tried to warn them about the raiders, he was ignored. Which made me go, really. The guy comes home, tries to warn everyone and he is ignored/written off as mad. I felt awful for Elysia when the raiders came. The village was razed to the ground, people burned alive in their houses and the dead burned in the middle of the town. I wanted to cry when she found one of her brother’s charred body in her house and then realized that she lost everyone. Her father, her mother, her boyfriend/best friend, her brothers in a single night. She was the only person from her village who escaped the raiders. She was also injured and saved by twins, Malia and Sofia, who had been held captive by Rogar, the leader of the raiders. It was stumbling upon a group of raiders who have had captives that they came up with a plan to rescue the captives by poisoning the raiders. When Nicolette and Darius showed back up, I was waiting for the fur to start flying and for the other shoe to drop with her. Talk about a girl who was insecure…Nicolette was. She seriously annoyed the ever-living out of me when she was in the book. Now, it was mentioned that Rogar sent someone to spy on Elysia and it didn’t take me long to figure out who it was (want to find out who…read the book). I was surprised when Elysia was kidnapped and given to Rogar. I shouldn’t say I was surprised that she was kidnapped, it was who did it and how it was done that surprised me. Who she met while she was in his palace (aka the White House) and what she sees sets the tone for the rest of the book. I liked the romance between Rhys and Elysia. It was sweet and if things hadn’t happened the way that they did, then I do believe that it would have gone places. But the romance with Darius was the one that I think Elysia needed. Now there is a huge twist in the story that took me by surprise and I kinda went “No way” when the book ended. I am interested to see where this twist is going to go in the next book. The end of the story was pretty interesting and again, like I said in the sentence above, I am pretty interested in seeing where this is going to go in the next book. Why: I really enjoyed reading this book. I liked that you could see Elysia’s transformation from a teenager to a woman. I also liked that the author created a semi-love triangle. There are some aspects of the story that I am really interested in seeing where they go and who the new enemies will be. I inhaled this book, reading it in 1 day. Can’t wait to read book 2! !